New bottle features a built-in measuring cup! One ounce for small loads and two ounces for large loads. Microfiber is the new terry cloth! Whereas manufacturers and detailers used to recommend terry cloth towels and applicators as the safest, softest fabric to use on delicate clear coat finishes, they are now hailing the incredible cleaning properties of microfiber. It is simply softer, more absorbent, and has greater polishing capabilities than traditional terry cloth. The thick, woven core locks away dirt, liquid, and grease unlike any other material on the market. Because there has never been a material like microfiber before, there has never been a detergent capable of properly cleaning it…until now! 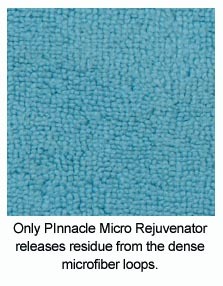 Pinnacle Micro Rejuvenator is not your average detergent. It is formulated specifically to meet the unique demands of microfiber. Since microfiber pulls contaminants deep within its fibers, conventional detergents may not remove all of the stains. Micro Rejuvenator is made specifically to break down stain molecules deep inside the weave and suspend them until the rinse cycle washes them away. Thanks to a powerful degreaser, oily automotive stains don’t stand a chance. We call it Rejuvenator for a good reason. After a wash with Pinnacle Micro Rejuvenator, your microfiber towels and applicator pads will feel as fluffy and soft as they were the day you bought them, even more so. Even after frequent washings, the microfiber will retain its texture and absorption. Laundry detergents may saturate the fibers and flatten the weave. Clean-rinsing Micro Rejuvenator will actually restore your microfiber and make it feel softer with every wash.
Pinnacle Micro Rejuvenator is biodegradable and non-toxic. It works equally well on cotton, chamois, and buffing pads. 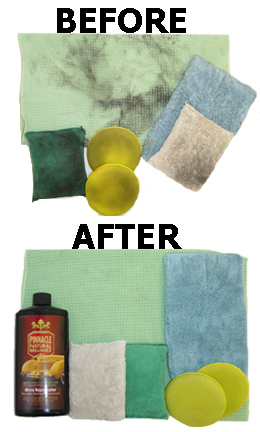 Restore your microfiber towels and pads every time you wash them with the detergent formulated specifically for microfiber – Pinnacle Micro Rejuvenator! A handy measuring cup is included with every bottle. For a small load, add 1oz. to your wash. For a full load, add 2oz. to your wash. For heavily soiled items, add 1oz. to a 5 gallon bucket filled with water and let soak before washing as usual. Pinnacle Micro Rejuvenator is safe to use in high efficiency washers. It is such a delight to shop online with them. My orders arrived safely as and they were packed well. They always have something I need or just want. Thank you for being there.